WATCH IT IN FULL HERE!! Film Synopsis: Eleven years ago, a massive undersea earthquake triggered an Indian Ocean tsunami, killing 167,000 people in Indonesia’s Aceh Province. Since then, strict sharia law has grown in influence. Punk’s freedom of expression clashes worldwide with political and religious dogma, and here the ongoing crackdown has driven punks further underground. Punks causing minor transgressions become scapegoats, distracting attention from the real issue in Indonesia – rampant corruption. Punks are labeled a ‘social disease’ – life would be easier if they conformed, but this small community remains. The Aceh punks made headlines in 2011 when 64 were arrested. Punishing them for being punk, and subjecting them to “re-education” regimen. As Indonesia’s economy prospers, many are disenfranchised. Street Punk! 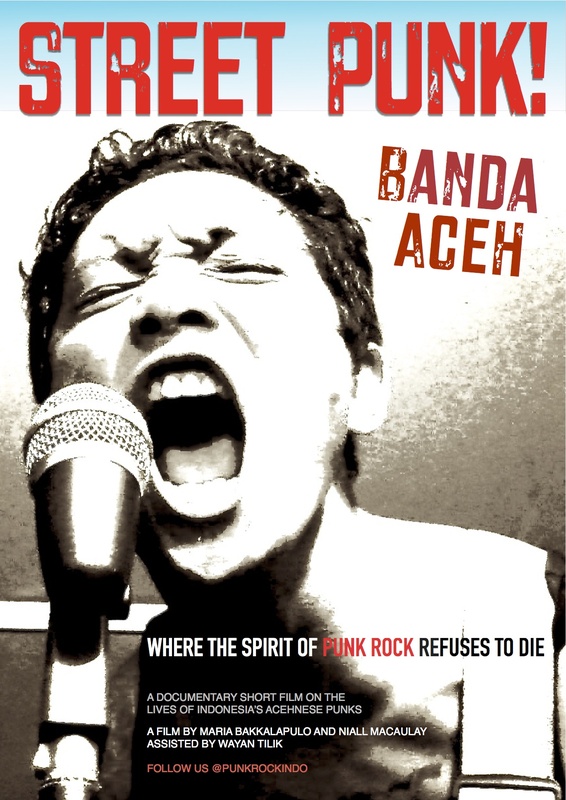 Banda Aceh examines the changing society, and witnesses its punk community adapt, exist and find their identity in one of the country’s most restricted regions. MUSIC FROM THE SOUNDTRACK! Check out the VIMEO link above for some serious punk rock from Banda Aceh! The Aceh punks are fresh out of the studio for a recording session and you get to be the first to hear a track that will be featured in the soundtrack. This is the first time these guys have been able to get their music recorded on anything better than a mobile phone. Some of the best, most sincere and visceral in-your-face punk rock we’ve ever heard. Play loud and please feel free to share the Soundcloud link and help us build the buzz! Street punk, street punk. Never give up. Street punk, street punk. Will always move on. We always take abuse. Entering right and coming out left. What you say is meaningless. Because to us, you are a loser. The hypocrisy is stabbing your own belly. Too many words but unused. Our scream will hit you. To make you aware, and know shame.